Which Hygienic Hand Dryer Does the Hospital Choose? In 2010, Northwestern Memorial Hospital (NMH), one of the country’s premier academic medical centers, launched a major hand washing campaign aimed at employees, patients and visitors: Clean hands every time. It sounds easy enough, but according to a hospital press release, two-thirds of Americans fall short in adopting the habit of washing their hands. 80 percent of infections are transmitted through touch. If hands are kept clean, the transmission of germs from person to person is greatly reduced. As part of a hospital-wide education campaign on the importance of proper hand hygiene, NMH even self-produced a sing-a-long video parody featuring hospital staff demonstrating their best hand washing techniques. The Northwestern Memorial Hospital Infection Control Board concluded that XLERATOR was the most hygienic hand drying option. 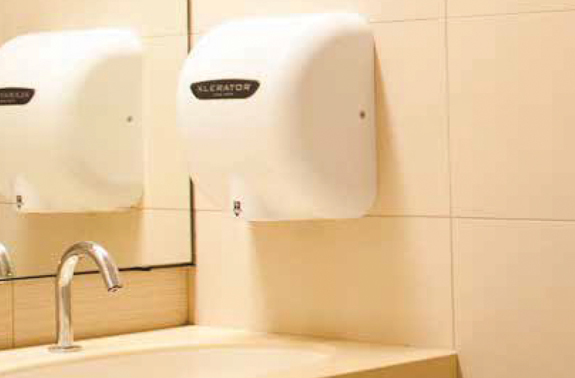 Over 100 XLERATOR hand dryers were installed – meeting the board’s rigorous hygiene standards. While hospital administration was encouraging its employees, patients and visitors to do their part to prevent the spread of viruses, Northwestern Memorial Hospital’s Director of Facilities Engineering, David Stout, was also beginning his own campaign – a major hospital refurbishment program that would include equipment and product upgrades to the hospital’s restrooms. “A primary focus has been reducing maintenance needs while improving sanitation in the hospital’s hundreds of staff and public washrooms,” says Stout. “As washrooms are renovated, we’re installing equipment and materials that are much easier to maintain, have longer life spans and keep the restrooms sanitary,” he said. Going into the refurbishment project, Stout and his team were faced with daily restroom plumbing and maintenance issues related to paper towels. “The paper towels were getting flushed down the low-flow toilets, causing blockages,” said Stout. “The continuous plumbing calls combined with the high levels of restroom maintenance were taking up a considerable amount of time and costly resources. That’s when we got serious about looking into heated air electric hand dryers.” What’s more, Stout said that damp, used paper towels were regularly piling up in and around bathroom trash receptacles. Left unattended, dirty paper towels can create a breeding ground for bacteria. A study published by the European Cleaning Review affirms that, “unless paper towel waste is regularly cleaned [up], it can be a lasting source of bacteriological infection” (September 1994). While high-speed hand dryers are regarded as a hygienic hand drying choice in facilities around the world, facility managers should research their options carefully, as all hand dryers are not created equal. Manufacturer designs vary between a traditional – with the hands positioned under the air outlet or a trough-style – in which the user puts his/her hands into a trough like area or enclosure. After review, the NMH Infection Control board concluded that dryers with traditional high velocity heated air streams were the most hygienic option, citing concerns that trough-style dryers could catch and hold water blown off users’ hands, leaving pools of stagnant water where bacteria can grow. The trough area is also susceptible to collecting trash and foreign objects such as hair, gum and/or other liquids, further creating an unhygienic environment and potential breeding area for bacteria. With approval from NMH’s Infection Control board, the facilities staff installed over 100 XLERATOR® high-speed, energy-efficient hand dryers the first year, thus meeting the hospital’s rigorous standards for hand hygiene. Unlike conventional hand dryers, which average 30 to 45 seconds of drying time, XLERATOR dries hands three times faster (completely in 10 seconds)* and uses 80% less energy than conventional hand dryers. 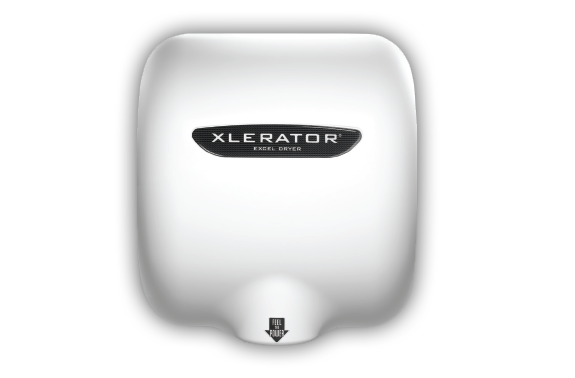 XLERATOR represents a 95% cost savings when compared to paper towels, reduces maintenance and improves restroom hygiene. XLERATOR is also the only hand dryer to be MADE IN USA Certified, the first hand dryer to be GreenSpec® Listed and helps facilities qualify for multiple LEED credits. Installation of the high-efficiency hand dryers complemented the hospital’s existing low flow plumbing fixtures; toilets, sinks and urinals. It’s an approach that is echoed in Excel Dryer and McGraw Hill’s latest CEU course, Bridging Cost and Care: Global Benchmarks for Healthcare Environments. The educational course emphasizes how high-efficiency hand dryers and plumbing fixtures can help improve care while reducing the total cost of healthcare delivery. “It’s designed to help facility managers run smarter, greener facilities,” said Gagnon. “Installation of XLERATOR hand dryers at Northwestern Memorial Hospital is a perfect demonstration of how facility managers can meet stringent hygiene guidelines, while saving money and reducing their environmental impact,” said Gagnon. “The truth is, heated air, high-speed, energy-efficient hand dryers are the most hygienic hand drying solution for healthcare facilities.” To date, over 120 dryers have been installed at Northwestern Memorial Hospital’s main campus with more to come as the hospital embarks on the building and opening of two new facilities – its Lake Forest campus and most recently, its Northwestern Organ Transplant Clinic in Joliet, IL. “We look at this product like it was tailor made for us,” concluded Stout. Stout’s cost savings analysis, which compared the facility’s current paper towel use to the installation of (30) XLERATOR high-speed dryers revealed an initial annual savings of over $20,000. Cost savings and benefits also came in the form of reduced transportation costs, paper towel storage and waste reduction. “After installing the dryers our plumbing issues were eliminated and our bathrooms were cleaner,” said Stout.